Hi everyone! 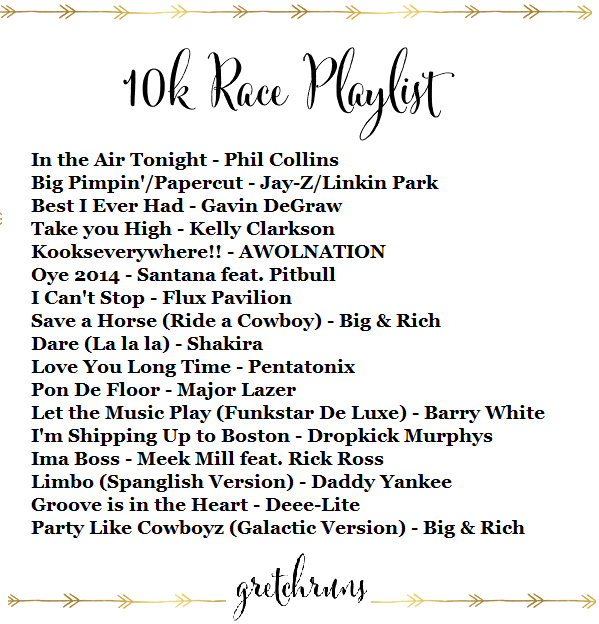 Today I thought it would be fun to share my playlist that I listened to during my 10k this weekend. 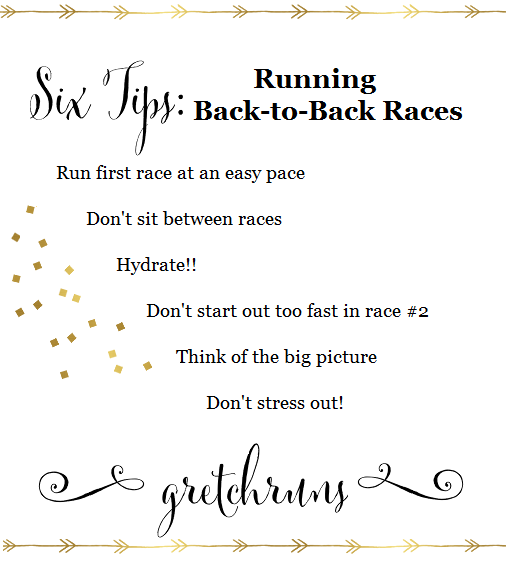 I also wanted to give some tips for having back to back races - I ran a 5k, and then 15 minutes later ran a 10k. This is becoming more and more popular, so I just wanted to share a few tips on what worked (and didn't work) for me! Let's get it started with some music. I shared another playlist a while ago - my easy run mix. Check it out here! Once again, all of the songs in this list are available on Amazon music, so you can download and listen for free if you have Amazon Prime! I also put the list on Spotify if you'd rather listen there. I like starting my playlists off with a slower song so I don't start off too fast, then slowly pick up the tempo towards the middle. I like including different genres of music (this goes from country to rap to Latin!) to keep things interesting. Now, let's get into some tips for running one race after another. This all worked for me, but remember that I'm not a running coach or nutritionist, so different things may work for you. This is just what worked for me! 1. Run your first race at an easy pace. You probably won't be able to PR in both races, and want to be comfortable for both. 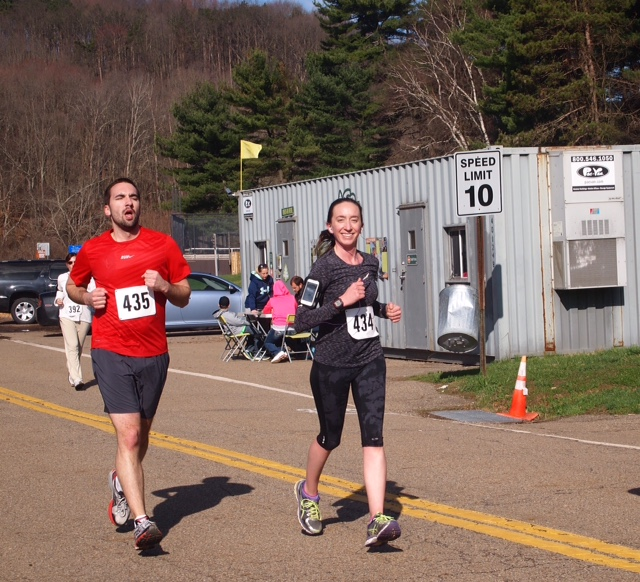 You might be tempted to go out at your normal pace for this race, but take about 30 seconds per mile off. It should feel easier than normal! 2. Don't stop or sit down between races. It might be tempting to immediately sit down to rest between races, but don't do this! Lactic acid is building up in your muscles after a strenuous activity, so you'll want to keep moving to prevent muscle soreness. You don't have to keep running, just walk around and keep your legs fresh. Light stretches can also help. 3. Hydrate between races. It's very important to keep hydrated, especially on warm days. I drank some water with Nuun in between my races. I made sure to not drink as much as I usually would after finishing a race. I get nasty cramps if I hydrate too much during a run, so I only had about 4 ounces of Nuun and a honey stinger gel between my races (this is about equivalent to what I would have during a race water stop.) I also made sure to stop by the bathrooms so I wouldn't have to stop during the second race! 4. Don't start out too fast in the second race. When your next race starts, it's tempting to start out fast, since you just got done racing. Take it slow for the first half mile to shake out any soreness from stopping, and to get back into the racing mindset. If you start out too fast here, you may regret it later! 5. Think of the big picture when hydrating. Although I don't usually stop at water stations during a 5k or 10k, I always hydrate if I run more than 6 miles. Instead of thinking of my races seperately, I think of it as a 9 mile/15k run. I change up my hydrating strategy to go along with this. At the race, I drank my Nuun and a honey stinger gel at mile 3 (between races), and had water with a saltstick cap at mile 6 (halfway through the 10k). Even though I normally wouldn't want water or supplements in the middle of a 10k, I had to remember that I was 6 miles in and still had 3 miles to go. This really helped me finish! 6. Don't stress about times. Runners are always worried about getting a PR or negative splitting during races. It's still important to push yourself, but try to have fun! Double races are tough and are not normal racing circumstances- so just let yourself have a slower time than normal and enjoy the race. I didn't run my fastest 5k or 10k, but I had so much fun and let myself be happy just to finish. It was tough to run back-to-back, but I finished! That's an accomplishment in itself! What are some of your favorite songs to listen to for races? Have you ever run two races back-to-back? Any tips? Linking up with Erika, April and Patty with Tuesdays on the Run! Back to back races can be tough, but you are right--they are totally doable, as long as you take care of yourself during and in between and prioritize! So true :) It was challenging but I'm really glad I did it! I would definitely do it again! Thanks for stopping by, Susie! I ran a 5K and half marathon in the same weekend, but never two races in the same day. Great advice - it seems so challenging to get the pacing right! It was definitely challenging! 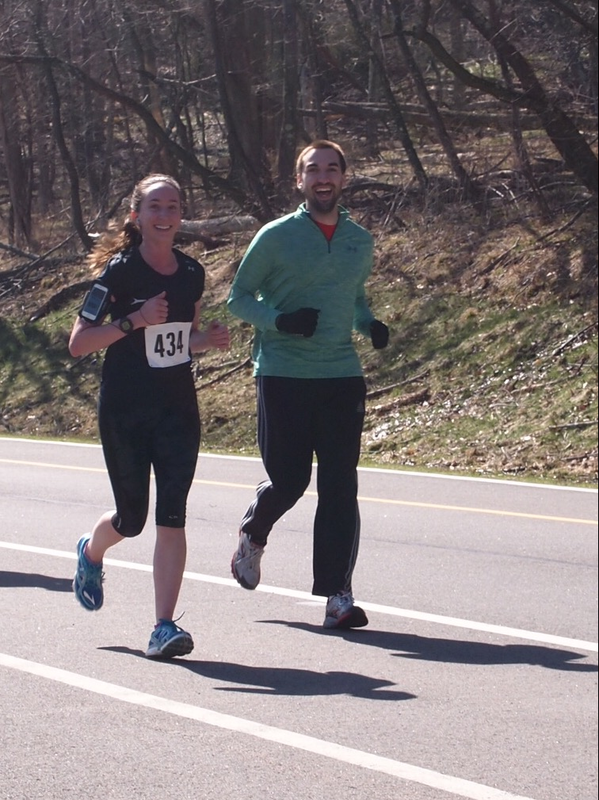 Luckily I was helping to pace Dan in the first race, so it was a really good warmup for me. I think if I "raced" both it would be a lot harder! Good for you. I can barely imagine running one race, much less two. I love your playlist! Random but awesome. Where can you go those saltstick caps? I needed salt during my last half and couldn't get it until the end. 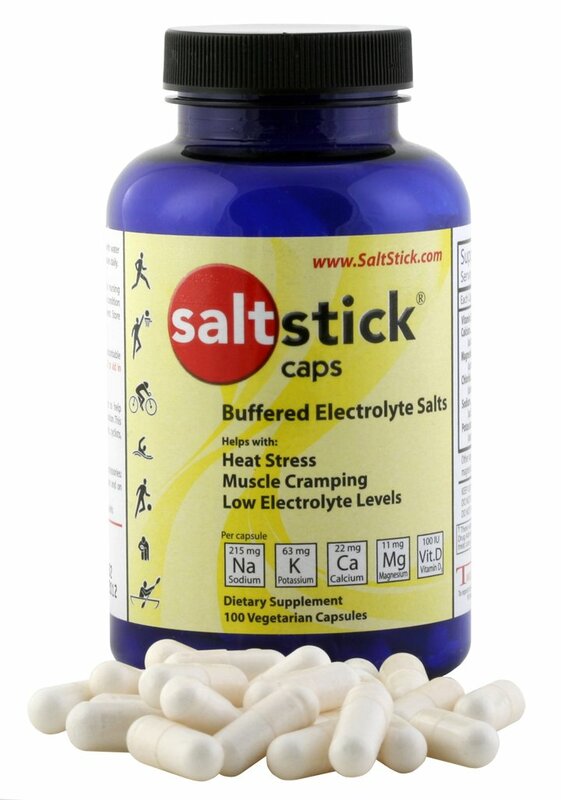 I ordered them from amazon- http://www.amazon.com/SaltStick-Electrolyte-Replacement-Capsules-Supplement/dp/B002IY96B0/ref=sr_1_1?ie=UTF8&qid=1429016633&sr=8-1&keywords=saltstick+caps . Not sure if they're available other places or not? I haven't run back to back in the same day, but I have run Ragnar and a lot of back to back (ie, two days in a row) races. I'd agree with your tips. Sounds like a fun race! I'm glad you agree! I want to do Ragnar some day..seems like a lot of fun. I love how diverse the artists are in your playlist. Looks a lot like mine! I use SaltCaps too, particularly when its warm. I haven't done back to back races only same day (morning and night). Great tips! I don't really listen to music when I run, and especially in races when there are crowds and bands and all that, i don't need it! Salt caps are great, i like my salted caramel gu for all the salty and sweetness of it haha. Ohh I love that flavor as well! I can only use gu for training runs for some reason. My stomach freaks out in races so I need something super light. You should definitely try! They're a lot of fun. Most of the time there's a package for multiple races and it's barely more expensive than a single race! Good luck! Great job running back to back races! Thanks for the tips! I've never used the salt caps but I've heard good things about them. I'll have to give them a try one of these days. Those back to back races are becoming more popular. I'm good with running just on race per day! That is such a random playlist - I love it! I also love Daddy Yankee Limbo - have had it on my workout playlists ever since I heard it at one of our Latin America sales kickoff meetings. AHh it's such a good song! It makes me want to dance everytime it comes on which helps me get a second wind! Thanks for another great playlist! Now that I'm starting to listen to music, I'm going to have to add this whole playlist to my player. 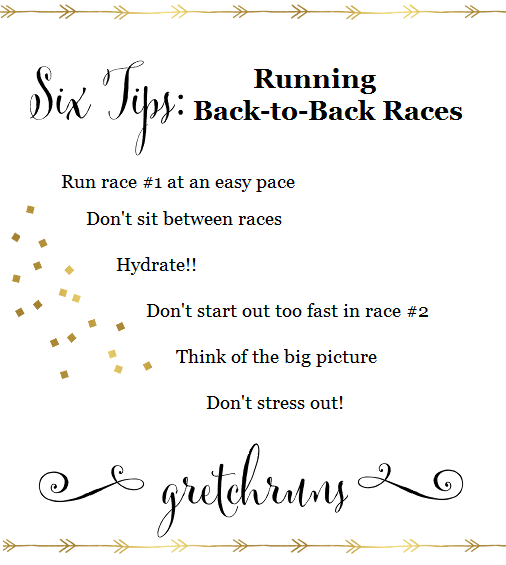 I have never run a back to back race but will keep these in mind if I do! yay!! I'm so glad that you like it Jennifer!